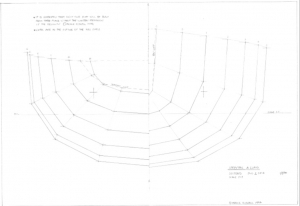 These are my older plans mostly pre 1993 when the plans were hand drawn on paper then traced on or either tracing paper or film. These were both sold my myself or in some cases published in magazines. 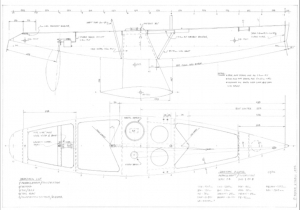 These plans are PDF scans of the original A1 and A0 format plans. In many instances they have not been available since 1996. There are some later drawings post 1993 that were computer drawn and also produced in A1 and A0 format. These in most cases have been reformatted into smaller A4 and A3 sizes for home printing. 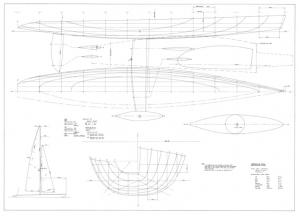 There is a third group of plans that will follow later which are designs for production boats that never published and that have been reproduced in 3D CAD. 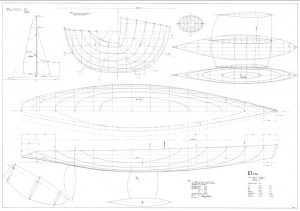 Some other designs were one off designs for customers and designs that were never built. This design was molded by Frank Russell very successful within Australia. The prototype was balsa planked in 1985 and won the ACT M Championship in 1987. Later molded boats won many Championships Including: 1989, 1990 and 91 ACT and NSW Champion, 3rd 1990 National Titles. Beam 260mm DISP 5.2 kg. This design was molded by myself and is the 10r version of the woodpecker Marblehead. This was a very successful design and was a departure from the long narrow heavy boats previously racing. LOA 1550mm LWL 1350mm BOA 290mm BWL 230mm Disp 6.6kg Ballast 4.6kg. Alien was designed at the request of a US sailor to suit light air US conditions. I don’t know if it was built or raced in that country, but several were built in Australia slightly heavier displacement by planking in 6mm balsa without reducing the planking thickness with good success in lighter conditions. 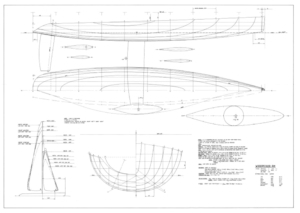 The hollow stern profile is now illegal but it can be easily filled in during construction. 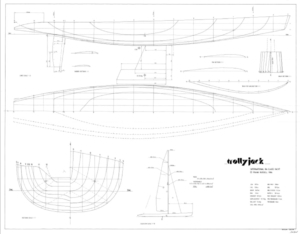 Trolleyjack was my first A class design to be published and was the result of considerable work on stability calculations as well as Sail Area, Displacement and Length Ratios. Trolleyjack seemed to be a successful boat and was one of the first Australian boats NOT to have tumble home and in that regard she was influential. She also featured a large QBL Length Penalty, something not explored again until the recent Gothica A. 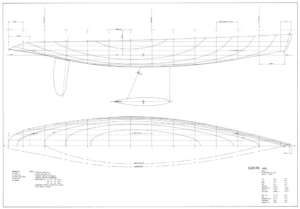 Some later boats were built with closer section spacing and a 1300mm Waterline to give a larger sail area. This design was the first attempt at a shorter, wider and lighter 10r. It designed and built in early 1988 while the Phoenix Mk1 was designed and built in the second half of the year. There were several Gremlins built in 1989 to 90 and all were successful boats. LOA 1650mm LWL 1350mm BOA 295mm BWL 230mm Draught 550mm Disp 6.6kg Ballast 4.6kg. The Phoenix 2 XL was a development of the highly successful P2 10r design specifically for the 1993 WC to be sailed in Australia’s Lake Bonny in South Australia. 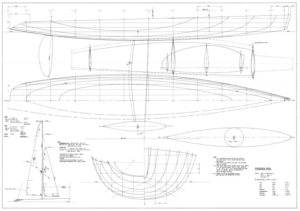 P2 was a very short ended design and the XL was a longer ended version intended for the open water and stronger wind expected on the lake. The stronger wind never eventuated but the boat proved very fast in the lighter wind winning several races and eventually finishing in 4th place. That boat stayed in SA after the event and dominated 10r racing for almost twenty years in that state. 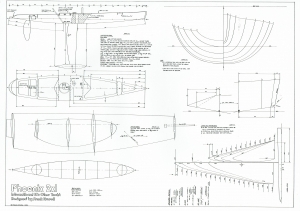 This design was published by Chris Jackson in Marine Modelling in 1993 and was available as a plan until recently. LOA 1520mm LWL 1300-1320mm BOA 283mm BWL 225mm Draught 550mm Disp 6.3kg Ballast 4.3kg. 4th 1993 10r World Championships. Numerous SA 10r State titles. ET was designed as a larger version of Alien A class to suit Australian conditions. This was still a very light boat for the time but was large enough to do well in most conditions.